I first saw Alien early in its theatrical release and it made quite a strong impression on me. No, it didn't freak me out or anything; although Alien can be scary, it's more of a "fun ride" scary than a nightmare-inducing vehicle. It simply offered me an experience unlike anything I'd previously witnessed in a movie. Granted, I was only twelve at the time, so it probably wasn't all that hard to show me something I hadn't seen, but still, Alien provided a chilling and thrilling kind of science-fiction film unlike the Star Wars rip-offs that then multiplied. Heck, I liked Alien so much that I directed my friends in a Super 8 parody called Alienated; a puppet version of Ernie from Sesame Street played the part of the creature. The film has held up extremely well over the years. (Alien, that is � I haven�t seen Alienated in quite some time, though I�m sure it�s brilliant.) With the exception of the computer displays it shows, almost nothing in Alien looks dated, and unlike silly movies such as Logan's Run, the vision of the future depicted seems plausible. Admittedly, we have no idea what the future will actually look like, but grittier views such as this one appears more believable these days. Alien offers an example of a tremendously well-crafted suspense film. It's fairly remarkable to realize that no real action occurs until the film is literally half finished; director Ridley Scott provides all the necessary exposition with such flair and panache that the viewer's interest level remains high. Scott effectively sets the creepy and tense mood of the piece within that time; he creates a convincing world and utterly immerses the viewer into it. I must admit that while objectively Alien holds up very well, subjectively is a different matter. Maybe it's just my MTV-addled attention span, but the film seems pretty slow at times. To a degree, this occurred as a result of the fact that I've seen the movie at least 15 times since 1979, but there are lots of other movies I've watched that many (or more) times during that span, and I don't get quite so sleepy during their first halves. I guess I feel that while the pacing of Alien is appropriate and effective, it suffers somewhat after repeated viewings. That's not to say that Alien doesn't sustain multiple screenings. After all, I have seen it an excessive number of times, and while I do sometimes feel somewhat bored while I watch parts of it, it nonetheless offers more than enough to keep me involved. A key reason for this is the alien itself. I think that bar none, it is the greatest movie monster ever created. It's not the scariest or the most powerful - actually, the stereotypical "grays" spook me the most, because they seem the most realistic since stories about them usually involve everyday life here on Earth - but damn if the alien isn't the coolest looking creature ever to sail through space. Don't even restrict it to monsters - I don't think that anything in any movie has ever been as perfectly designed as the alien; it's an amazing piece of work. As a tangent, H.R. Giger's stylistic and design influence over the film also strongly contributes to its continued appeal. While Giger's most famous creation is the creature itself, his imprint is all over the alien planet and ship, and these components help make an indelible impression. Visually, Alien offered such a distinctive experience that even almost 25 years later, most other films are still just trying to keep up with it. Another important factor behind the continued success of Alien is its cast. It's a terrific bunch of actors, all of whom provide solid work. Sigourney Weaver's career really started with this film, and while she'd provide better work in other movies - I think her work as Ripley in all of the sequels tops what she did here - she nonetheless offers a very strong and convincing turn in what was essentially her first film. No fault can be found with any of the cast. John Hurt's Kane leaves the least impression of the crew, but that's due to the fact that he receives by far the smallest amount of screentime. It's really a credit to Hurt that Kane makes any impression at all; despite his brief time in the film, Hurt manages to transmit enough information about the character that I feel as if I have some understanding of him. Each of the other five actors could justifiably be called the best of the bunch. While I prefer the cast of Aliens because I thought most of those actors really transcended the material, the crew in Alien surpasses their counterparts in the sequel from the point of view that there are no weak links; each and every cast member provides grade "A" work. Personally, if I had to pick my favorites, I'd go with Veronica Cartwright as Lambert and Ian Holm as Ash, both for fairly different reasons. Cartwright provides a fascinating performance because Lambert is the only crewmember who really approaches a mental breakdown. Most of the others manage to largely stay in control. Not Lambert; she got voted "Most Likely to Freak Out Under Pressure" in high school. Unlike the broad, comic work that Bill Paxton offered as Hudson in Aliens, Cartwright doesn't go for the extremes; she keeps Lambert's meltdown within realistic limits. It's simply fascinating to watch as she slowly deteriorates). While the first half of Alien can move a little slowly at times, I must admit I really like the sequences during which the ship�s crew interacts. Though some bond exists, they�re a cranky crew who display believable dynamics. You spend that much time canned up together, you�re going to get on each others� nerves, and that dynamic comes through here. It�s fascinating to watch the performers interact. After more than two decades, Alien has firmly established itself as a classic. It has barely aged over that span and remains a fine piece of work. While not the best of the series, it continues to startle and delight. 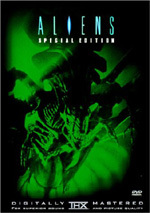 Alien appears in an aspect ratio of approximately 2.35:1 on this single-sided, dual �layered DVD; the image has been enhanced for 16X9 televisions. It seemed hard to believe that this film came out more than 20 years ago, for despite a few minor flaws, it looked like it was filmed yesterday. Sharpness appeared consistently positive. At almost all times, the picture remained crisp and well defined. Despite many very wide shots, I saw only a couple of minor signs of softness or fuzziness; for the most part, the image remained distinct and concise from start to finish. Moir� effects and jagged edges presented no concerns, and I detected no issues related to edge enhancement. Print flaws seemed startlingly absent. A couple of medical lab shots showed a smidgen of grain, and a speck or two of grit cropped up, but that was it. Otherwise the movie stayed remarkably crisp and clean at all times. Alien offered a suitably restricted palette, and the DVD reproduced this well. The colors looked clear and accurate at all times. Very few bright tones appeared; Parker�s bandana was pretty much the only consistent example of anything somewhat bold and vibrant. Nonetheless, the tones seemed clean and distinct at all times, and they lacked any form of bleeding, noise, or distortion. Black levels appeared nicely deep and rich, and shadow detail seemed appropriately heavy but not excessively dim. Despite the minor print flaws that occurred, this remained a strong picture most of the time, so I thought it merited an �A-� rating. While the Dolby Digital 5.1 soundtrack worked well compared to its era-mates, the audio definitely showed signs of age. The soundfield demonstrated reasonably good breadth. The forward spectrum dominated the presentation. From the front, music showed reasonable stereo imaging, but the effects were the strongest aspect of the project. The front environment showed nice spread and atmosphere, as it created a creepy and eerie environment. Surround usage seemed more limited. For the most part, the rears offered general reinforcement of music and effects. They became more active during some of the louder scenes. For example, those that involved the landing of the ship showed broad and enveloping audio. Still, the forward domain dominated the package, where it offered reasonably vivid atmospherics. Audio quality also appeared fairly good for its era. Dialogue varied, especially due to a lot of obvious looping. Much of the speech seemed natural and distinct, but some lines came across as flat and a little muddy, and some edginess occasionally affected those segments. At times, I also heard some vocal bleeding, as a few lines spread problematically into the side channels. Additional distortion cropped up with a few effects, and those elements often sounded somewhat thin and shrill. Bass response for the effects seemed limited for the most part, but those landing sequences offered some loud use of the low-end; the bass seemed powerful but somewhat boomy. Music also showed somewhat tinny tones, as the score occasionally sounded a little harsh. For the most part, I thought the track worked well given its age, but it did demonstrate a mix of concerns. Essentially a port of the laserdisc boxed set from 1992, Alien packs a nice mix of extras. Most of these come from that release, though not all of that LD�s materials make the cut here. Materials new to the DVD will be marked with an asterisk. Additionally, a discussion of the pieces that failed to reappear will follow my coverage of the DVD�s extras. The package starts with an *audio commentary from director Ridley Scott. He sits alone for this running, screen-specific affair. It's a decent but unexceptional piece. Scott spends most of his time discussing technical aspects of the production, though he occasionally talks about other issues about the movie. Scott gets into both visual and practical effects and he also relates some of the backstory he created for the characters and circumstances. A bit too much praise appears, and Scott also just narrates the movie somewhat too frequently. Nonetheless, this remains a generally solid and informative effort. Alien also includes two other audio tracks. We find an *isolated score; that's a nice addition, but not one that does much for me. However, the other *alternate audio channel is surprisingly fascinating. It plays some unused music cues and also quite a lot of on-set, untreated sound. In other words, it's basically an alternate soundtrack for the film; we hear much of the movie as it actually existed on the set before any effects were added or dubbing was performed. I know, this probably doesn't sound like much, but you have to experience it to understand just how cool it is. I turned on the channel just to check it out; I expected I'd probably sit through about five minutes of it and move on. Forty-five minutes later, I was still listening to it. Many of the supplements came straight from the LD production. Among them are ten terrific deleted scenes - including the nearly legendary cocoon sequence - and two interesting outtakes; the filmmakers regard outtakes as different from deleted scenes in that the latter were more properly finished and look more like they come from a completed film, whereas the former are much rougher. The cocoon sequence also includes an audio commentary from Scott; I haven't checked, but that track seems to echo the interview footage of him that appears right before the cocoon scene on the laserdisc. Anyway, they both perform the same function, to explain why Scott did what he did with the scene; they simply achieve this goal in different ways. Just the inclusion of this wealth of unused material would be great, but the extras continue: the DVD provides extensive still archives in its photo gallery. This section presents conceptual art, storyboards, production photos, and promotional art and photos. This section replicates much of the LD's supplement, but it functions as more of a sampler; it offers a substantial percentage of the LD's materials, but it doesn't give them all. Still, it's an impressive collection. Finally, the DVD includes two TV commercials and one trailer that appeared on the LD set. Interestingly, the DVD also offers a *second trailer that did not show up on the LD. In addition, the DVD has a few other components missing from the LD set. These are present in the form of *Easter eggs. No, I won't tell you exactly how to find them; just mess around a lot with the arrow keys on your remote and you should get to them soon enough. One "Easter egg" barely qualifies as an extra to me: that's the DVD's production credits. No disrespect to the folks who put this thing together, but I don't regard it as a "treat" to read their names. I guess this is a good idea, however, to make these credits a "bonus," because it probably draws a lot more attention to the participants than it otherwise would. Still, if this is a supplement, then so is chapter search. The other two "eggs" are much more fun. One of them presents text of "Ash's notes." These document "Ash's" comments about the four life stages of the alien. Very entertaining stuff. Finally, I do want to mention what supplements do NOT cross over from the LD set. As I already mentioned, the LD goes into much greater depth in regard to the still-screen material it presents; the DVD offers only a representative sample. Some areas on the LD are not really touched upon at all; for example, the LD presents an extensive chapter about the screenplay that is not replicated on the DVD. The LD also includes a very substantial amount of video footage that does not appear on the DVD. On the LD, we see many minutes of behind the scenes production footage, most of which is very interesting. That set also presents two different fairly brief but interesting interviews with Scott; one of these occurred during the filming of the movie, and one was (then) current. Despite those omissions, Alien provides a solid package. The movie earned its status as an innovative classic, and despite some slow spots, it holds up well after all these years. The DVD presents startlingly excellent picture with dated but generally positive audio and a fairly nice set of supplements. 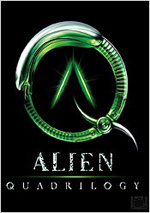 A good release of a great movie, Alien merits your attention. Footnote: this review covered the original 1999 DVD release of Alien. This edition went out of print and has been replaced by a 2003 version. The latter includes both the theatrical cut of the film and its 2003 director�s cut. It also presents a slew of new supplements, though many of those found here don�t make the set. Die-hard fans will want to own both since the old one includes audio features that don�t show up on the 2003 release. However, for those with less interest in the movie, the 2003 version is the one to own.